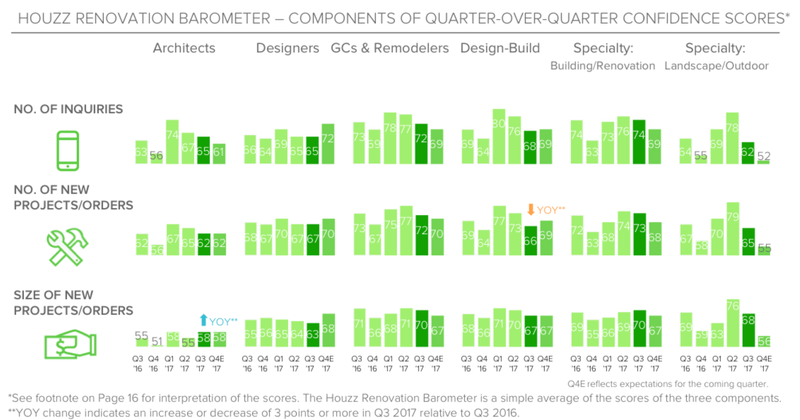 Houzz released its Q3 Renovation Barometer, a report that tracks confidence in the home renovation market among a range of industry professionals, such as interior designers, architects and professional landscapers. The report, which records differences in year-over-year and quarter-over-quarter market improvements, showed respectable third-quarter readings, ranging from 62 to 72 out of 100 — a 1-8 percentage point decrease from the previous quarter. According to Houzz, the decrease is due to the seasonal slowdown as fall and winter draw near. The 2017 Q3 barometer showed small upticks in quarter-over-quarter increases in optimism and confidence across all firm types, thanks to increases in the number of inquiries and the size of new projects and orders. The number of new projects and orders across all firms were either unchanged from Q2 or experienced slight 1 to 2 percentage point decreases. The only sector to experience a notable decrease in the number of new projects were landscapers. General contractors and remodelers led the way with the highest number of inquiries (72), number of new projects (72) and size of new projects (70). In terms of the variances among the four major regions, architecture firms in the South and Midwest weakened because of a late-summer onslaught of hurricanes. According to the report, hurricanes caused 28 percent of renovation-related businesses in the Houston metropolitan area and 41 percent in southwestern Florida to suspend business operations in these areas. Among companies that suspended operations, 91 percent of those impacted by Hurricane Harvey and 65 percent of those affected by Hurricane Irma kept their doors closed for a week or longer. Moreover, the hurricanes increased project backlogs by almost two weeks on average. Renovation-related companies estimate the average total cost of repairs and renovations for homeowners to be $13,000 for the hardest Irma-stricken areas, and a staggering $111,ooo for the hardest Harvey-stricken areas. Lastly, Houzz says Q4’s barometer is likely to show a slowdown in the West, due to the ongoing wildfires in Northern California.